A criticism often levelled at restaurant reviewers is that they can't give a fair judgement on a place after a single visit. Most bloggers have neither the time nor the means to visit every restaurant they write about multiple times, especially if it was a place they didn't particularly like in the first place. Well, today I visited El Faro, a Spanish restaurant on the Isle of Dogs for the third time in as many weeks. This was, of course, because I'd already decided it was bloody great and I just wanted to try absolutely everything on the menu. Let's skip back three weeks . . .
. . . It's 8am on the day after my birthday party and I've just gone to bed. My friend Tristan calls and reminds me that I'd arranged to take him for lunch for his birthday. "Call me at 12:00, it might be alright", I mumble before passing out. He pessimistically makes the call, I bounce out of bed, deluge myself with hot water and soon enough I'm in a cab on my way to El Faro. I'm still pretty dazed and confused though and there are certainly a few uncertain moments. But then the food starts arriving and the more I taste the better I feel. This food is like magic and there's actually a chance it might completely forestall my decline. Cinco Jotas Jabugo ham served with toast with tomatoes and olive oil. This melted in the mouth and had good flavour. I did wonder if it could have been sliced more thinly. Grilled vegetables on flat bread with sardines. Really really nice, very fresh sardine, veg cooked to retain just enough texture, solidity provided by the flat bread platform. Pork belly confit cubes with apricot and thyme. A real star, soft and flavourful, stylish presentation, tiny bits of crunchiness. Asturian home made chorizo, cooked in cider served with a balsamic reduction . . . creamy texture, pretty spicey, good presentation. 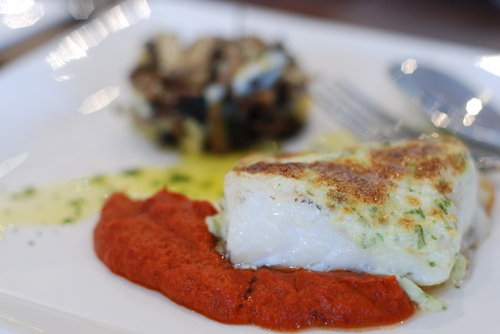 Cod glazed with allioli with spring garlic and Vizcaina sauce. This fish had amazing texture, perfect two stage cooking . . . oven then grill. The sauce was really good too. Everyone agreed that this was something rather special. T bone steak with padron peppers. You buy this by weight and they brought out the steak to show us before they cooked it - good colour and marbling. This was slightly charred on the outside, but bloody in the middle . . . just the same as I'd had at a wedding in Basque country a few years ago. 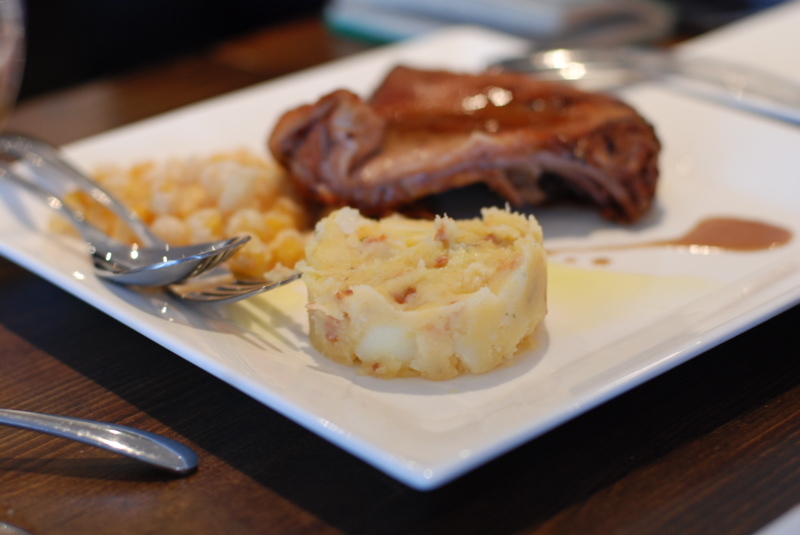 Patatas Bravas were subtler than usual with two sauces drizzled over the sauteed potatoes rather than drowning it. For dessert I had a crema catalana espuma served with an apple and cinnamon crystalised jam. A bit sweet but enjoyable nonetheless. One of my friends had passion fruit cheescake . . . exceptionally good, very light texture and clear flavour. We had beers then a £40 bottle of Pesquera and then at the end a Millenium Dolce dessert wine and brandy. In total, with water and service, £180 . . . not bad at all. I resolved to come back soon with a clearer head to make a another assessment. The opportunity arose for a dinner the week after with some foodie friends. This time, rather than curing a hangover the meal calmed me down and cheered me up after a tough day at work. To start with we shared a selection of starters. 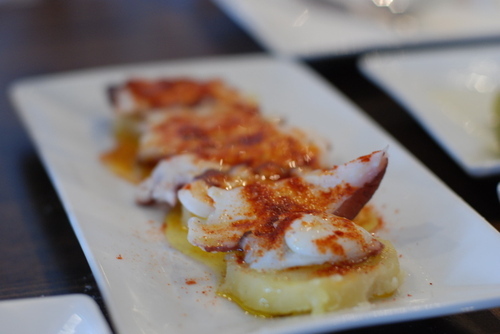 The octopus (pictured) was one of the highlights. Apart from this and some cod, we seemed to eat 90% pig. The waitress demonstrated where the 'secreto' cut of pork by running her finger down her shoulder, while several kinds of wrongness ran through my mind. This meat had just the right texture and came with a fantastic chorizo mash. Slow cooked pig cheek was melt-in-the-mouth, just as it should be. Today's lunch somehow didn't reach the heights of the previous two meals . . . thus justifying the multiple-visit proponents? There were still some lovely dishes though. 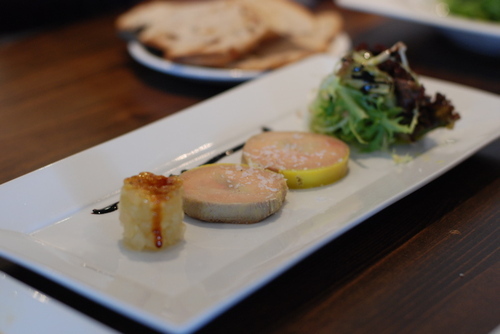 This foie gras dish below was meant to come with some apple and cinnamon ravioli. Can you see it on the plate below? That's a tower of the filling on the left. When we pointed this out to the waitress she returned to the kitchen and then delivered an explanation that the chef had run out of pasta dough, but offered to make some more. We thanked her but declined the offer. Cod, pictured below, was not as good as on previous visits, this time lacking the melting flakiness I'd come to expect. A dish of suckling pig (only available from Mondays to Wednesdays) was excellent - tender and full of flavour. There was a welcome return of the chorizo mash too. I've concentrated on the food so far, but the service and atmosphere at the restaurant are very good too. The waiting staff are knowledgeable and efficient while at the same time being friendly and relaxed. The restaurant can adapt to many types of clientele . . . at the first Sunday lunch we were surrounded by happy families, much like being in a restaurant in Spain. On the next Thursday evening it was full of social diners and the place had a bit of a buzz. Today, while we enjoyed a relaxed lunch, some Canary Wharf business types were clearly finding it an agreeable spot for a working lunch. But back to the food and drink. I should mention that the, entirely Spanish, wine list is rather good. I don't know much about Spanish wine but everything I've had there has been interesting and good . . . and when I've Googled it later I've found that they were well rated wines. the range of sherries by the glass is particularly good. And what of the style of the food? In some ways it's a simple re-interpretation of Spanish classics . . . but there is a deft use of modern techniques behind the scenes and you'd be hard-pressed to describe the food as truly rustic. It comes as no surprise that the chef is ex-El Bulli. Thanks for the culinary temptations . . . looks like you had quite the treat.